The Cleveland Indians are a game away from the World Series and the Boston Red Sox are a game away from extending the series to seven games. Tonight’s match up is crucial for both teams which should make it well worth watching. 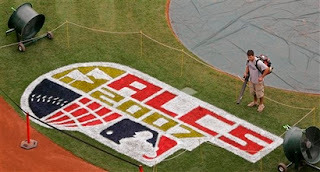 Come by the forum, cast your vote on who you think will win the series and share your thoughts in the ALCS thread. Dang It, I Missed the Voting Deadline! You Can’t Print Without Ink! Search Engines, A Bloggers Best Friend? Another Upset in the Works?